Its easier than ever to get a great cardio-vascular workout in today’s environment. You can use your body by itself, for example by running and walking, and there are also tons of great tools to help you. There are many different varieties of bicycles, treadmills, and elliptical trainers. Ellipticals are the best choice for people who have knee problems, or for those who have been sedentary for extended periods of time. And they come with all kinds of different options. With over 30 brands, many of them having different models, you’ll have no problem selecting the right one for you. Many different factors affect an elliptical workout, so to narrow down the options look at these details. There are a lot of great models out there, and there are also many that are poorly designed. Some models simply ignore the ratios of the human body. For example, some models have ratios between the handles and foot pedals that don’t match up with the body, leading to an unbalanced workout. The best way to avoid this is to try ellipticals out before-hand. The peak distance between the two pedals in motion is called the stride length. Most people will be okay with a length of 18-20″. If your height deviates significantly from the norm however, your optimal length may be shorter or longer. As a general rule, longer stride lengths equal more complete workouts. Different models have different degrees of sturdiness. For frequent use, make sure to get a good brand that is nice and durable. If you plan to use sporadically (Because you participate in other forms of exercise), you’d probably be fine with a cheaper design. Weight restrictions are very important. If you don’t pay attention to them, you could end up breaking your elliptical right after you get it. To eliminate this possibility, pay attention to any limits and buy a machine that fits you specifically. Your body gives you better feedback than a website or catalog. To get a great fit, go to a sporting goods store where they have these machines. Try a few out, and you’ll have a much better idea what to get. Always remember that exercise equipment should be best for you, not necessarily the best for anyone else. Find the right configuration of options that makes you most comfortable. With all the brands there are, it should be a breeze to make the right choice. 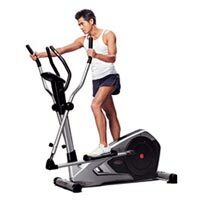 If you’d like to improve your fitness, head over to Ellipticals And Exercise to get the latest information on exercise, fitness and exercise equipment.